The revolutionary technology that has come to define the Information Age can allow us to do much more than just surf the web and check our emails. Over the course of the past few decades, the Internet has had a similarly transformative effect on industrial infrastructures as well. The Internet of Things (IoT) is a catch-all term that refers to any devices or appliances that are networked together via systems such as Ethernet, WiFi, Modbus TCP or RTU. It’s become a popular buzzword among tech writers in recent years, but IoT devices have been successfully implemented in industrial settings for quite a while now. In fact, we showcased this technology way back in 1997 at the Rockwell Automation Fair. Today, we offer native Ethernet/IP connectivity on all Case Control Systems. So what benefits does the IoT offer in the context of compressor controls? First and foremost, connected compressor controls offer superior efficiency and reliability compared to traditional air supply systems. 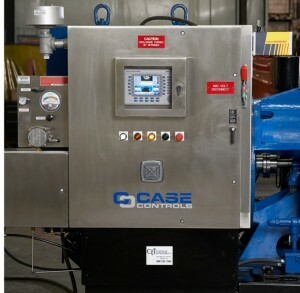 When multiple air compressors are connected to a programmable logic controller (PLC), a master control system can monitor the air supply system and make continuous adjustments to keep the compressors running at maximum efficiency. This makes it easy to evaluate compressed air KPIs over time. In the event that one compressor in the system fails, the master software can even step in and automatically trigger another compressor to pick up the slack. This, in turn, can make the air supply system far more stable and reliable. Interested in learning more about the IoT capabilities of our compressor control systems? Give us a call or contact us online today to speak with a representative!